Currently, I prefer to keep the knives that I use in a knife block, but for knives that I don't use too often or don't fit in the block, I store them in a tray placed in a drawer. I like to protect the blades with knife covers. My two favorites? Forschner's Edge-Mag and LamsonSharp's Knife Safe. There are several different knife storage options for the home kitchen. The knife block is a very popular way of storing your knives. Knife blocks look good and are very convenient -- perhaps too convenient. If you've got children, storing your knives in a block is a dangerous proposition. So, is using a magnetic bar mounted to the wall. For households with hands controlled by inquisitive minds, it's generally best to keep your knives tucked away in a drawer. Improper storage in a drawer, however, can be more dangerous (to both you and the knife) than storing the knives on the counter or wall. Loose knives are an accident waiting to happen the next time you reach into your drawer without paying attention. The knives may also chip while rattling against each other as you open or close the drawer. Using an in-drawer knife tray can protect your knife and help you organize them too. I have two problems with knife trays. First, they consume a fair amount of precious drawer space, and, second, I can't seem to find a tray that can handle the different knife shapes (and brands) that I have. There's always one or two knives that just don't fit properly. So, I've taken to using knife covers and placing the knives in a drawer organizer tray. A variety of knife covers exist -- the most popular type involves inserting the knife in a folded piece of plastic with a slicing motion. I really don't like this type of knife cover because you can't easily wash the cover (what if food, dirt, or other undesirables get stuck in the cover? ), the knife scrapes against the cover as you insert it, and you're holding the cover in your hand while making a cutting motion into the cover. My preference is for knife covers that open up for knife insertion and cleaning. The knife cover should close tightly against the knife, but not allow the knife to wiggle or move to prevent scratches from being made by the very device designed to protect the knife. Let's take a look at my favorite solution: the Edge-Mag. Forschner's Edge-Mag comes in a variety of lengths ranging from 12 inches to 3 inches. The cover is only a couple millimeters thick (like those plastic covers that you cut into), but is capable of unfolding. Basically, it's two magnetic strips that are held together along a joint set in the long side of the cover. When opened, the Edge-Mag can be washed and fully dried (important to avoid rusting of your knife). The knife can be easily inserted by placing the flat part of the blade directly onto the interior surface. The magnet holds the knife firmly in position. Closing the other side of the Edge-Mag completes the magnetic sandwich that securely holds the knife without increasing the thickness of the knife by too much. Enclosed in the Edge-Mag the knife is safe for storage. Also, I've found this to be the best way to protect knives in a knife roll or bag. The cover doesn't take too much space, and, when several of the Edge-Mags are stacked near each other, the magnets help keep the knives from moving during travel (the Edge-Mags covers "stick" to each other). I also like using the LamsonSharp KnifeSafe. It's a bit bulkier than the Edge-Mag, but it completely covers the entire blade in plastic. The cover opens up on hinges and can be washed easily enough. Make sure the knife and the KnifeSafe are both completely dry before storing the knife (to prevent rust). 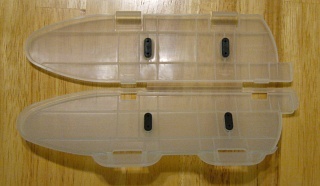 The knife sits in the KnifeSafe on top of two rubber pads. Opposing rubber pads on the other side of the cover holds the knife in place when closed. The KnifeSafe comes in four sizes. The largest is able to hold knives of 10-in. to 8-in. in blade length and the smallest holds 2-1/2 to 4-1/2 inch knives. Because of the placement of rubber pads, it's important to get the correct size (while a large Edge-Mag can be used for any size knife). When closed, two tabs lock the cover in position, and the knife is secure. The KnifeSafe is great for transporting a knife from one location to another - your neighborhood knife sharpener will thank you. I picked up my KnifeSafes from Sur La Table for about $5 each. For some reason, their online website does not have them, so I offer you this link from Chef's Resource instead. This site has a few good solutions for knife storage and transport. It also sells the Max-Edge knife protectors. Thanks, I've updated the article to include the website. Even if you have a knife roll, you'll need a knife cover for each knife in the roll. At least my roll (and the rolls that I've seen), doesn't protect the blade. The Edge-Mag and the plastic covers you cut into are the only ones slim enough to work well enough in a full knife roll. A friend had a great tip regarding knife blocks - she taught me to insert the blade blade-side up so there isn't any wear on it when you slide it in and out of the block. I thought that was very clever. If you are a cheap engineer, check around your local sign shops, I'll bet they'll have some scrap pieces of magnetic vinyl (too small for signs) that they might sell you dirt cheap (or even give you) to make your own magnetic covers. Blade side up is definitely one way to avoid your knives scraping against wood, but it's also quite dangerous. Every knife block manufacturer will tell you not to place your blades upside down in their knife blocks. The danger is two fold (as it was explained to me): 1. People expect the blades to be facing down. A visitor extracting a knife from your block may not realize that the blade is facing the opposing direction. 2. With the knife handle on the bottom and the curve of the blade on top, the knife has a greater tendency to slide out of the block if tilted or partially extracted. If the knife was not properly inserted fully into the block, the knife can slip out instead of in as expected. Most block manufacturer's that I've spoken to feel that the wood does not appreciably dull the knife when you insert the knife into the block. You're not cutting into the block, you are inserting the knife and the blade runs along the wood (just like when you slice food on your cutting board). Some knife block manufactuer's make blocks with slots going sideways (like the one I own), but they came this is for aesthetic reasons and not to reduce wear on the knives. Great product, so simple, functional and economical. How come it takes so long for ideas like this to become available? Thank young for reviewing my product. I was a chef in SF when I came up with the idea for the Edge-Mag. After patenting it, I was very fortunate and was able to license the distribution to Forschner. Its great to read your comments, THANK YOU! I currently use the KnifeSafe when I go to friends places to cook or help out. I like it because it can't get knocked off, and its more secure than a towel, or other similarly fashioned knife protector. I got mine at Williams Sonoma. The large size fits my chef's, santoku, and global deba knifes, so I think it's pretty versatile. Were can u buy EDGE_MAG. Beside on line store? I purchased mine from my local restuarant supply store. You may want to check your yellow pages or perform an online search for a restuarant suplier near your location and see if they carry it. I think Tina also mentioned that she saw some being carried in either Bed Bath & Beyond or Sur La Table, but I suggest you call those stores first. if the swiss are selling the edge-mag. why can't you buy it in europe? I've seen many latino and asian cooks in kitchens I've worked in use cardboard cut out the exact dimensions of the knife, then wraped with the circulars from sunday papers, the glossy and almost enamel paper and then wrapped again by the plastic wrap from the kitchen. Creates a nice protective barrier around the knife and is cheap and easy. paper guards are very dirty. please don't use!!!!!!! I put my knives down the crack between the stove and the counter. Free, no edge wear, convenient. I made a couple sleeves out of cardboard from a cereal box. cover it with black duct tape and it is durable and looks decent. When in block EDGE UP, kn is now resting on spine of blade ( where you may rest your thumb ) & about 1-2" in from the tip ,Right On the Edge, dulling a very usefull part of the edge. We own a chain of cutlery stores & a couple of months into each new employees time, we come in to see all the knives in blocks up side down. Everyone must think of this revelation at one time or another. I've tried the knife safe on a carbon knife, and the rubber nubs that hold the blade ended up staining the blade, even though the knife was only in there for a short period of time (a few minutes). I was able to remove the staining after some time, but ended up returning that holder. Has anyone tried a these on any ceramic knives? I have a few Kyocera ceramics and have yet to find a solution I like. I don't like putting them in a block and am currently just using the drawers, but don't like the idea of the ceramic blades banging around with everything else - too brittle and too expensive. I do the exact same thing. It is very convenient and makes them easy to access. I am looking for a edge guard for a cleaver. I have not seen anything available. What would you suggest? If you can find the magnetic covers (Forschner Edge-Mag) then I'd suggest using that and just covering the edge of the cleaver. The rest will hang out, but at least the sharp parts will be covered. YES!!! Horizontal is the best way. The knives don't rest on ANY part of the edge. Furthermore, the knife block slot doesn't get worn when you slide the knife in and out. At least that happened to my first knife block that had vertical slots. My horizontal slotted block is now older and gets more use than my first one and doesn't show that wear pattern. great information on how to care for kitchen knives. my husband's an engineer, so this site got my attention purely by its name. i'll be sure to pass it on to my friends who are engineers, too. Please wash and dry your knives before you put them away. Covers or blocks. Leaving food on your blades is just as bad as putting them loose in your drawer. Oh man, why would anyone leave food on their knives? We sell the magnetic knife guards that can also fit a cleaver. These can be cut to size for any knife. Not often that you google for a recommended product (edge-mag) and find that the patent for it is up for sale: http://www.freepatentauction.com/patent.php?nb=4092 - auction started in June and he doesn't look in massive hurry to sell (presumably unless the price is right). After reading An Edge in the Kitchen, I ordered the drawer knife tray that the author recommended and I am really pleased with it. The design allows for holding eleven knives in a staggered fashion. I am actually going to order a second one for my knife drawer. One will hold Japanese knives that need to be wiped off frequently and the other will hold my European stainless blades. Here is a link to one brand. There are other companies that make it with the same design too. I have accumulated over 2 dozen different quality German, Swiss, Japanese, and French kitchen knives which I do alternatively use often. I've been looking everywhere for a rack that would hold this many different shaped knives safely yet handily for frequent use. Well, far as I can tell, there just anything available for such an array of different blades. So I decided and am designing my own device. It will be an upright transparent plexiglass cylinder (or could be squared) on a rotary device so I can turn it to whatever knife I decide to extract. It will be filled with very small upright plexiglass rods that can shift and move depending on the size of the blade. Depending on the size rods I use, I may round off the top ends so that the knives tract into the array of rods more easily. It will look smart and modern and be placed on the counter out of the way but in an area where I do alot of cutting. I guess I should patent it since I've read so many different comments by people looking for a way to handily store a larger number of blades.